45-Caliber Justice: I WANT ONE!!! 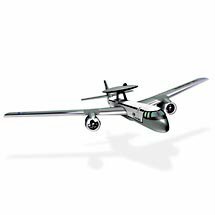 Take fantastic digital pictures from an eagle's-eye view with the amazing Estes XB 39 Eagleye Radio Control Digital Camera Plane. The giant Eagleye has a wingspan of 55 inches, is 34 inches in length and has twin ducted fan jet engines. Best of all, you can take up to 26 aerial photographs with a simple push of a button on the transmitter. Tell the MSM to stick it. Some People Just Need It.